Charming vacation cabin, newly restored. All the charm of yesteryear with all the modern luxuries you have come to expect. The cabin is beautifully decorated in classic style with the original 80 year old pine floors. The original fireplace with gas logs. Beautiful queen cherry high bed, cherry bedroom suite with sled bed, white wooden bedroom suite. The screened-in back porch has wicker furniture. Come sit on the front porch and rock in the white wooden rocking chairs and watch the deer in a near by field. Alderman Worrell Cabin is located approx, 5 miles from Mount Airy, the hometown of Andy Griffith, Mayberry Day with a lot of the cast from the Andy Griffith Show, hometown of Donna Fargo and Miss Winston Cup (1982), Largest open face granite quarry, Pilot Knob Park, 8 winery, antique shops, golf courses. Galax ,Va is approx. 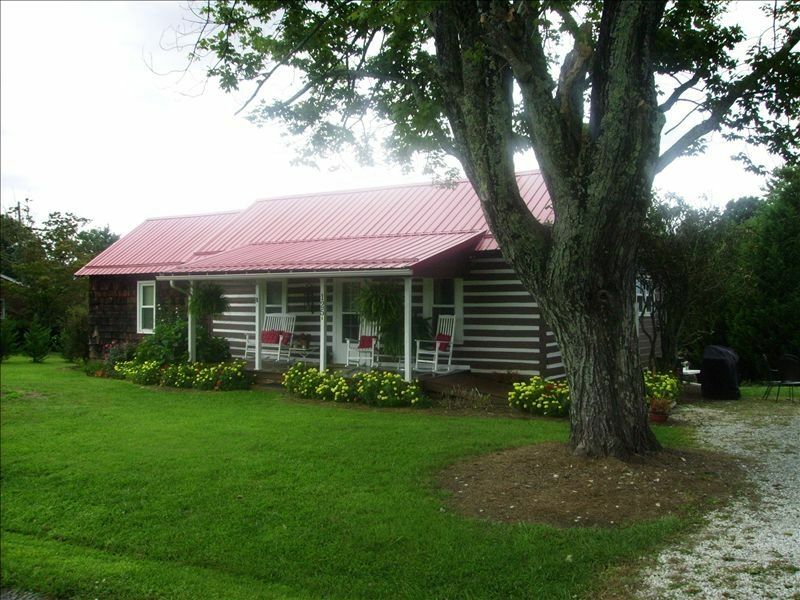 18 miles from cabin with shopping, antique shops, Fiddler Convention, and rafting. Blue Ridge Parkway is 10 miles away with the rustic Mabry Mill, Floyd Fest, Golf course, winery. Hillsville has the Labor Day Flea Market and Gun Show. Relax and Enjoy !!! This cabin was like being at home (maybe better)! Very comfortable! Spotless! Close to Mount Airy! We had to make a last minute arrival change and the owner was so accomadating. We had a WONDERFUL stay at rhe log cabin! We enjoyed the peace and quiet, and we’re just minutes from downtown Mount Airy. Will definitely be back again! The cabin was great and perfect for our needs. It was in a great area where we could get on the Blue Ridge Parkway and easy access to Mt. Airy. We had a wonderful time seeing all the sights. Carolyn and Tony were very attentive to our needs. If you are visiting this area, I am sure that you will find this cabin very suitable. The cabin/house is beautiful. Comfortably decorated and had everything needed for a great stay. Owner is so friendly and easy to work with and caregiver for the property lives right next door. Such a wonderful place where we felt right at home. It provided everything we needed and was very comfortable, and was a good location as well. Carolyn, the owner, has done a great job welcoming her guests in this beautifully furnished home and gave us a wonderful experience We hope to return. Many thanks!! I was so happy to read about your recent visit to my family cabin. I love to visit my first home. It always brings back good memories. I have tried to make the cabin that both my guests can come and have everything they need to feel right at home. This was a beautifully decorated, well kept cabin. Absolutely the most relaxing vacation I have taken in years. Tony, The caretaker is the most delightful person, very receptive to needs and insightful to local food places. Than you so much for your review of my family's cabin. It is so good to read about my guests' experiences while staying at my cabin. I hope you will return soon.